While most people may picture orthodontic procedures as something that teenagers need to go through, children of all ages may benefit from seeing an orthodontist. In fact, many younger children may benefit from seeing an orthodontist at an early age rather than waiting too long to see one. If you want to be one of many parents that seek an early opinion and start planning your child’s dental health as soon as possible, seeing an orthodontist early may be the right move for you. Here are five reasons why you should take your child to an orthodontist in San Mateo. Upper jaws are one of the features of our bodies that stop growing very early, as early as age 8 in many cases. The lower jaw, though, continues to grow along with the rest of our body. This is actually a blessing in disguise, as orthodontists can monitor upper jaw growth from an early age. By the time your child reaches seven years old, you can take him/her to an orthodontist to make sure that the upper jaw is problem-free and to ensure that lower jaw growth is going as planned. Baby teeth are a sign of childhood, and losing them is just one sign that your little boy/girl is growing up. Unfortunately, some baby teeth find it hard to let go and can become stuck when your child’s permanent teeth are coming in. This is fairly common and has the potential to cause problems in your child’s dental future. 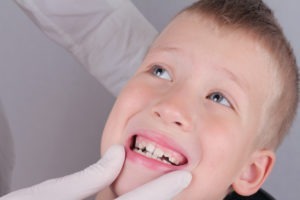 If your child is having issues with their baby teeth, it is a good idea to see an orthodontist in San Mateo promptly. The orthodontist can guide the dentist to remove the teeth that are stuck so that your child’s permanent teeth can grow in. Even if your child has not lost all of his/her baby teeth, permanent teeth have already been forming and can be counted from an early age. Orthodontists can count your child’s teeth to make sure everything is forming to plan. If your child has too many teeth, the orthodontist can figure out a plan to remove the extra teeth, while a child that is missing teeth will have to wait a few more years before the teeth are replaced. While orthodontic emergencies are rare, it is good to know someone that is on call in case your child has any issues from an early age. Orthodontists can perform even better after an emergency when they know your child. If anything, it is a good idea to bring your child for a quick check-up to get to know an orthodontist and be ready for any teeth emergencies. This is an especially good idea if your child plays contact sports like football or hockey. Sleep apnea is a worry of any parent, and it can have many causes. If your child is suffering from sleep apnea, an orthodontist may be the solution you need. Obstructive sleep apnea occurs when the airways are partially blocked due to various reasons. In order to correct obstructive sleep apnea, an orthodontist can widen the child’s palate or advance lower jaw to allow him/her more room for breathing, and better sleep at night. Do You Need an Orthodontist in San Mateo? Whether it’s for an emergency or to check up that everything’s going to plan, taking your child to an orthodontist is never a bad plan. It can provide some valuable insight into your child’s dental future. If you need a trusted caring and experienced orthodontist in the area, make sure to contact us to make an appointment at either one of our offices!